After completing a stage for the first time, you can get at least 4 times more Coins depends on the number of Zombies you killed, after that, the number of Coins will be equal or around the number of killed Zombies. Thanks to the Combo feature, you can get more Coins on some stages, refer below for more info. firing zombies. Once you release it, the Combo will restart to 0 again. - Use your other hand/finger to switch weapons or to use Guard Weapons. Guards will not be included to your Combo count. Ghost King doesn't kill so it's ok to use when farming Coins. - Notes: Coins are gained during and after the battle. - The Coins below are the total estimated Coins per completed battle. - Just select "Retry" to play the stage again. - Stage 6-6 will be your main farming stage until you reach the EGY Stages! 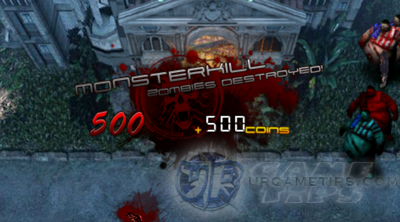 - Recommended if you have both "Kill Zombies" and "Kill Dog Zombies" tasks. - I recommended this if you have both "Kill Zombies" and "Kill Doctor Zombies"
or "Kill Fat Zombies" tasks. - Complete all Stages labeled with "Extra Reward" to get more Cash and Coins. - Tap on the red (+) icon at the upper right corner. - You can buy Coins and Cash here with "Real Cash". - Will require you to download and install apps to get rewards. - Gamble 2 Cash for a chance to get up to 9999 Coins.